Albion chairman Tony Bloom says there is lots to look forward to in the Premier League next season, including the return of the club’s ‘intense rivalry’ with Crystal Palace. The Seagulls have not played Palace since the 2012/13 season, when the Eagles beat Brighton 2-0 in the second leg of the Championship play-off semi-finals at the Amex and then went on to win the final and get promoted into the Premier League. 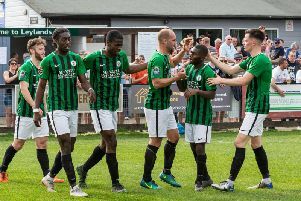 Albion’s promotion means the arch rivals will lock horns again next year and Bloom said: “It’s going to be great for our fans and for their fans. I think a lot of them will be happy to be playing us in the Premier League next season. The Premier League fixtures for next season are announced on June 14 and it’s not just the matches with Crystal Palace that excites Bloom. For the first time since 1991, Brighton will run out at Wembley, with Tottenham Hotspur playing home matches at the national stadium while White Hart Lane is being redeveloped. Bloom said: “There’s lots of things to look forward to in the Premier League. “You’ve got six of the biggest clubs in the world coming to the Amex and we’ll be going to their stadia. “The trips to Wembley and the Olympic Stadium are going to be very exciting events for us but every game is a big game.